People playing solo great highland bagpipes. I have yet again revised my G major highland bagpipe setup which involves tuning the drones to low G instead of low A and then retuning the entire chanter. This latest iteration has me running Kron Standard drones (because they’re the flattest AND most accommodating drones), Ross Omega drone reeds (due to their inherent customization) fitted to brass tubing reed extenders, laminate Colin Kyo chanter with some putty in the E and C# holes to tune them correctly to G drones (super flat because E adopts the tuning of the standard F#; the C# actually gets turned into a C natural so it needs putty AND tape), and a Gilmour reed. 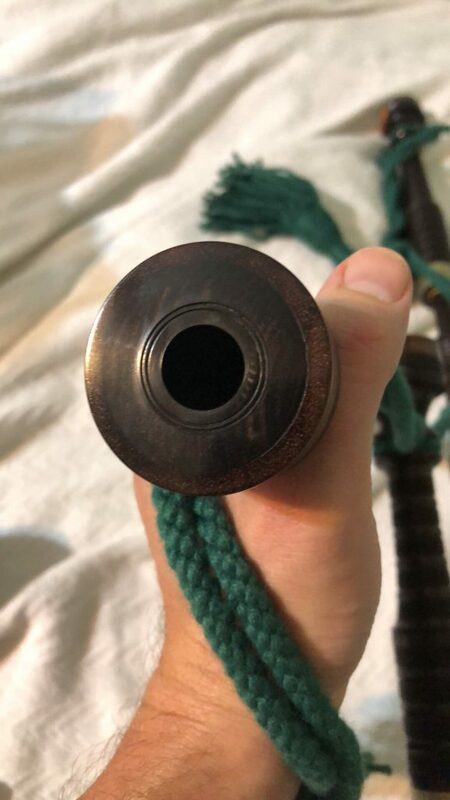 I think it would be really grand for a pipe maker to make a version of this chanter where the note we call low G is tuned to concert pitch A 440 Hz. On a nominal modern highland pipe chanter that tunes around 480 Hz, low G would sound around 427 Hz so we really aren’t that far off. All it would really take is bringing low A up to concert pitch B 493.9 Hz (some modern chanters are already here!). The holes would also need to be shifted and resized to accommodate tuning to the G drones in addition to turning the C# into a C natural. But, what really happens by setting low G to A 440 Hz and turning C# into a C natural is you get what pipers would call a G Major chanter, but since it’s tuned to A 440 Hz, every other musician would call it an A Major chanter. This has the distinct advantage of there already being commercially available drone technology to tune drones to an A 440 Hz reference and it opens up a whole host of new repertoire. Yay! I’ve collected some tunes and you can see them on my Free Tunebooks page (G major chanter tunebook). My setup has low A tuning around 464 Hz which means my low G is at 413 Hz which is why it’s so hard to get my drones so flat! So really, I’m just a couple Hz shy of having a G# Major chanter since my low A is so close to Bb 466 Hz. Here are some shots of the drone reeds and how far out the bass drone has to tune. The tenors are actually down a fair bit. I use sticky putty (the tacky stuff college kids use to stick posters to the wall, Blue-tac or something like that) to flatten the notes that need super flattening because otherwise the holes become so taped over that the sound is greatly muffled. 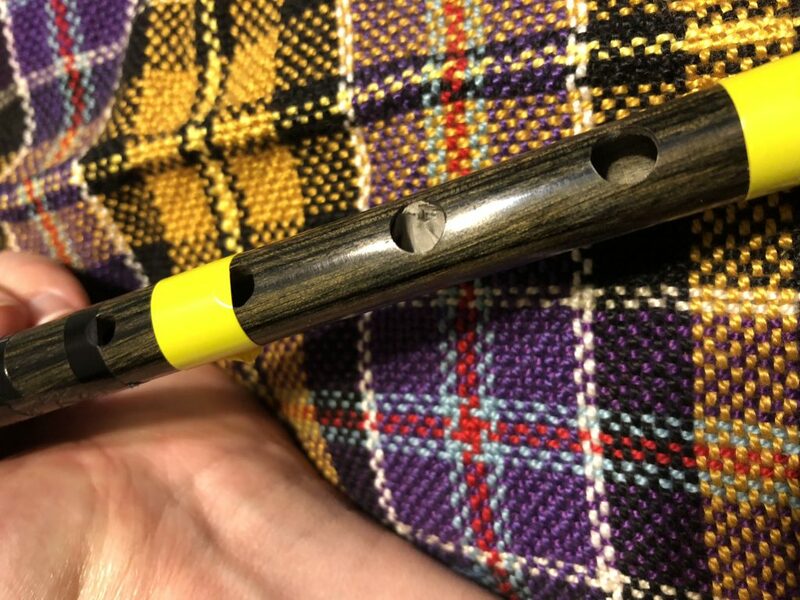 Occluding the chanter bore with putty is much more effective for such drastic changes and doesn’t attenuate the volume as much. 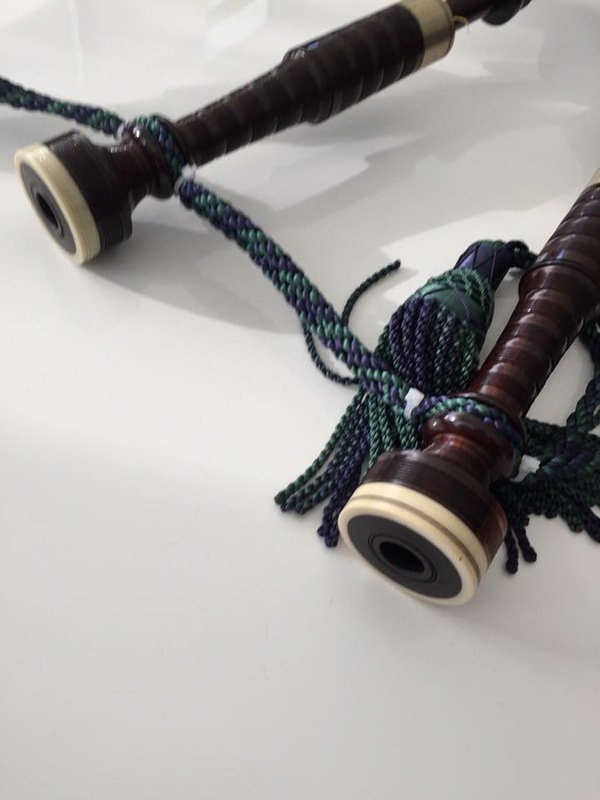 The chanter has two types of tape on it. I usually use automotive pin-striping tape as it holds up against the heat without getting sticky and it leaves no residue. However, the tape is rather thin and so it is not very good for taping large open areas because it can get wavy. The yellow tape is the best electrical tape I’ve found for taping chanters (it comes in black, don’t worry). It is Scotch Vinyl Electrical Tape 35 and I bought my most recent roll (brown) from Home Depot. So there’s your highland pipes in G for the day! 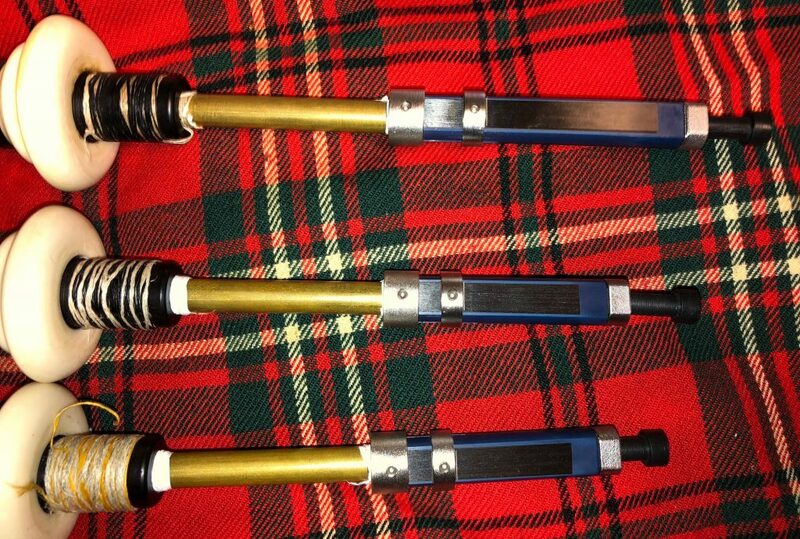 I have been loaned a set of Atherton Legacy bagpipes to feature for the blog. They were acquired as half-mounted nickel and artificial ivory but were shipped to David Davidse to have the nickel engraved. 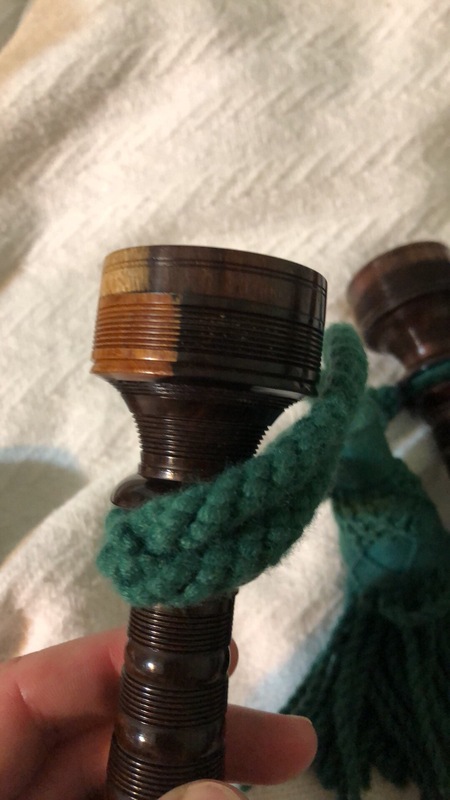 They’re tied into a medium Gannaway bag (no grommets) and played with a Colin Kyo chanter and custom Husk chanter reed. Bore dimensions lead me to believe Atherton’s Legacy model is based in the Henderson tradition. Drone reed experiments ultimately led to the use of an X-TREME bass drone reed alongside regular Ezeedrone tenor reeds. A close second was just the standard Ezeedrone bass reed, however it blended more readily and was therefore subdued relative to the power of the X-TREME bass reed. Of course the Henderson Harmonic Deluxe bass reed was also good though not as bold, but trouble with consistency from this brand bass reed keeps me from using it. Other drone reeds tested include all commercially available Crozier reeds, Selbie, original Kinnaird, Henderson Harmonic Deluxe, Redwood, and perhaps a few others. 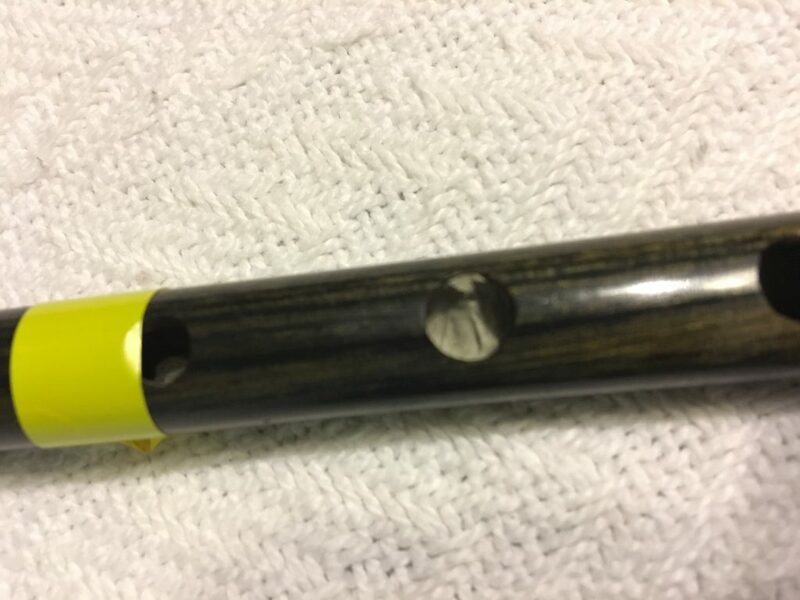 The combination of Ezeedrone tenors with a carbon fiber bass is very common as are pipes made in the Henderson tradition, more than a coincidence in my opinion. Popular carbon fiber bass reeds used in this combination include the Original Kinnaird and now Evolution Kinnaird bass drone reeds as is the previously mentioned Henderson Harmonic Deluxe. I am here to convince you that if you have not yet tried an X-TREME bass drone reed, you have not tried the best commercially available synthetic bass drone reed on the market. I used Original Kinnaird in my Gellaitry pipes for years until acquiring the X-TREME reeds at which point the X-TREME bass drone reed was used due to its superior tone. However, the Original Kinnaird tenor reeds remain in the Gellaitry as they give the tenors the extra power they need. A recording of this setup can be heard in this mp3 recording. Original Kinnaird tenors are too powerful for Henderson based pipes, and that proved true for this Legacy pipe; they were loud and brash. Henderson based pipes are known for their tenor volume and therefore a milder drone reed is needed. The X-TREME tenor reeds are a solid choice however regular Ezeedrone tenors offer a bit more harmonic overtone without being brash or nasal sounding. Following the success of the X-TREME bass reed in my Gellaitry pipes, it is not really surprising that it was also the best reed in the Legacy. It is deep and harmonic at the same time and is tonally superior to any other bass drone reed I’ve ever played, now proven in two commercially available pipes, Gellaitry and Atherton Legacy. Vacation and illness have taken their toll on my playing ability and endurance. I hope you enjoy the recordings below. This is only a small selection of the music I played during today’s practice. The chanter and drone interaction was harmonically strong and very pleasing. A fine pipe capable of supporting the chanter quite well. Irree ny Greiney (Sunrise) and Cullen Bay – This slow air was featured by Chris Armstrong’s band, Scottish Power, at the World Pipe Band Championships last year. Paddy Clancy’s, Lark in the Morning, & Merrily Kissed the Quaker – A few jigs in the Irish tradition I’m working on. The first tune was July’s Tune of the Month. Having switched studios, my daughter’s yearly dance recital did not conflict with the Rio Grande Valley Celtic Festival & Highland Games in May (Albuquerque, NM) so I finally had a chance to return to a favorite games of mine, after 15 years if I’ve done my figuring correctly. At only 5 hours away this is the closest piping competition to Lubbock, TX. Two weeks later, I competed at my first indoor competition, the Austin Piping and Drumming Competition; Austin is 6 hours away. If I were not going to Yellowstone for vacation, I’d also attend the Pikes Peak Celtic Festival in Colorado Springs in another 2 weeks (about an 8 hour drive), making my competition season 4 weeks long. But, that’s it really for games that have piping competitions. There’s one in Tulsa, OK in September but I can’t find a website, hrm. With owning many pipes, the first thing to do is pick which set of pipes to play in competition. The pipes I play most are my band pipes, my old Hendersons. The only other two currently in rotation are my Colin Kyo and Tim Gellaitry sets. It had been some time since I featured Tim’s pipe in competition and so I decided to go with them. This decision was reinforced by the glorious drone tone I’ve been getting with them. I have always loved the tone of them as one of the best and most stable using all original Kinnaird drone reeds, however I have recently switched to Chris Armstrong’s X-TREME bass drone reed and it is all sorts of fantastic. THE BEST BASS DRONE I HAVE EVER HEARD. Coupled with the tenors still using original Kinnaird, I get a most excellent, harmonic drone tone. I got many compliments from fellow competitors and judges alike on the tone of the drones. It should come as no surprise, my chanter of choice is Colin Kyo. A custom straight cut Husk was used in ABQ as their weather is similar to Lubbock’s but it started double toning on F in the humidity of Austin so about 10 minutes before I was to start my series of performances in Austin, I had to switch to a different CK chanter equipped with a Gilmour reed that’s as probably as old as my 7 year old son, luckily it played nicer with the humidity. 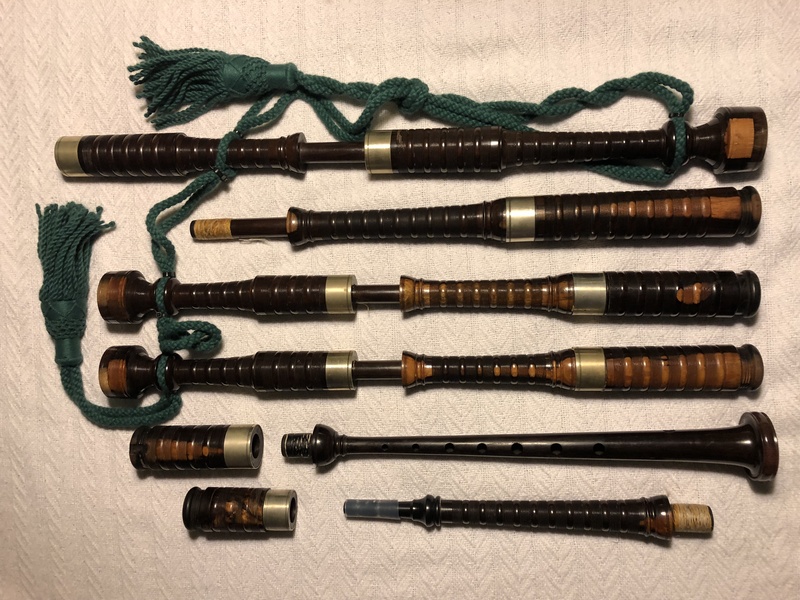 Below, you’ll find recordings of the pipes as played in Austin, though the chanter isn’t quite settled in for non-humid Lubbock as I’m still moving the reed and tape back to where they were prior to Austin. EJ Jones once told me it takes days to tune a bagpipe. TRUTH. The mic is behind me so you can hear the drones clearly (understatement of the month). Most of the tunes below are competition tunes and some are ones I actually played, but not all. Bessie McIntyre, Alick C MacGregor, Captain Lachlan MacPhail of Tiree – I almost make it to 90 bpm by the end! Highland Harry and Charlie’s Welcome – a bit quick into the terminal taorluaths in Highland Harry and just outright missing a few gracenotes in Charlie’s, haha. Someday I’ll get it! Clachnacuddin Hornpipe and Rakes of Kildare – Clachnacuddin Hornpipe is an old version of The Inverness Gathering arranged by Capt. John A. MacLellan and son, Colin, and is a previous tune of the month with sheet music available in the archive. One topic I have pondered much in recent years is tempo. I grew up listening to recordings of pipe music about as old as I was. Much of my MSR repertoire mimics the 1984 Grant’s Piping Championship album (available on iTunes if you can tolerate the random distortion from the “old” recording). While digitizing this album yesterday from my old cassette tape, I took a few tempo measurements. Iain MacFadyen played one of my MSR: Kantara to El Arish at 74 bpm, Inveraray Castle at 142 bpm, and Captain Lachlan MacPhail of Tiree at 95 bpm. Truly an engaging performance. The slowest reel came from Hugh MacCallum’s John MacKechnie at 85 bpm, Malcolm MacRae’s at 98, Murray Henderson’s at 92, Gavin Stoddart’s at 90, and Bill Livingstone’s at 94. Other strathspey tempos were anywhere from 128-138. Marches in the low 70s. I feel that common tempos have fallen to slightly lower values at the current time. Marches are often in the mid 60s, strathspeys right around 120, and reels in the low to mid 80s. While I have enjoyed more measured performances, with great care taken in rhythm, and have tried to mimic them on occasion, I have come to the conclusion that I prefer slightly faster tempos. Marches are for marching and strathspeys & reels are dance music (and I don’t mean modern highland dancing). Strathspeys are a derivative of reels evidenced by, if nothing else, the often quoted SWMW emphasis in 4/4 time strathspeys which directly coincides with the cut time of reels: 2/2. Piping has many idioms, and I find myself favoring the THIS IS A HIGHLAND BAGPIPE AND I’M GOING TO GET YOUR BLOOD PUMPING style because MACPHERSON HOLDS THE FLOOR. Growing up in Texas, I got to hear this tune from various groups Jimmy was associated with: Hamilton Pipe Band (precursor to the St. Thomas Alumni Pipe Band) and The Rogues. Hamilton featured the tune on their album “First and Ten” coupled with Hector the Hero (by James Scott Skinner). As with many other albums, these groups and their music influenced my repertoire and I’ve played The Rock for many years. Fate would have it that the first two parts became our introductory tune for the Lyon College Pipe Band medley at the World Pipe Band Championships in 2001 (2nd place in grade 3B under Willie Muirhead). I ran into Jimmy after a long hiatus at the North Texas Irish Festival where he and The Rogues are still jammin’ with Doug Frobese filling out the pipe section (Doug followed Donald MacPhee as pipe major of Hamilton). I get a request for the sheet music to The Rock regularly and so I asked Jimmy if I could share it as a tune of the month and he agreed! Yay! In homage to its roots, I perform it here with Hector the Hero and the graduated tempo increase into The Rock. Played on my Gellaitry pipes (original Kinnaird tenors/X-TREME bass) and Colin Kyo chanter (Shepherd Bb reed that is as hard as a rock, pun intended). Well, I’m just about done being sick since Thanksgiving. Being married to a pediatrician, having 2 kids, and teaching at a university of 35,000 students keeps one exposed and infected with every respiratory illness that goes around each year. But I’m coming back. My original goal for Tunes of the Month was to expose people to great competition type tunes that were seldom played, e.g. Murdo MacGillivray of Eoligarry. However, I got into a really big Irish music kick (could you tell? polka polka polka) over the winter break and so I’ve been throwing that stuff at you instead. And…it continues! Sort of. Willie’s Fling – Novice Tune of the Month – A great little 2 line strathspey you’re supposed to play like a reel. Don’t let the tempo catch you off guard, it sounds good slow also. Muineira de Casu – Intermediate Tune of the Month – A great 3 part “jig” from Galicia that’s a hoot to play and will challenge your Scottish based idiomatic playing like no other. I’m playing the first of 2 versions provided in the file; the second version is more common in the folk bands I’ve heard play the tune. Here’s some audio of me playing these tunes in a set together, though if you keep up with the blog recent posts have included these tunes for a little while. Willie’s Fling, Teampall an Ghleanntain, and Muineira de Casu – the 2 tunes of the month with some other tune in between. The pipes were going pretty well so I figured I’d challenge myself as I work to get my chops back from the long string of illnesses. Jeannie Carruthers, The Cowal Gathering, Inveraray Castle, Susan MacLeod, Captain Lachlan MacPhail of Tiree, and Alick C. McGregor – an MMSSRR in the style of the Former Winners March Strathspey and Reel competition at the Northern Meeting. The Redundancy, The Clachnacuddin Hornpipe, Rakes of Kildare, and Donella Beaton – a HHJJ because why not? The Hornpipe/Jig competition is often only HJ even at the highest levels, which I declare to be lame. You might be wondering which pipes I’m playing. 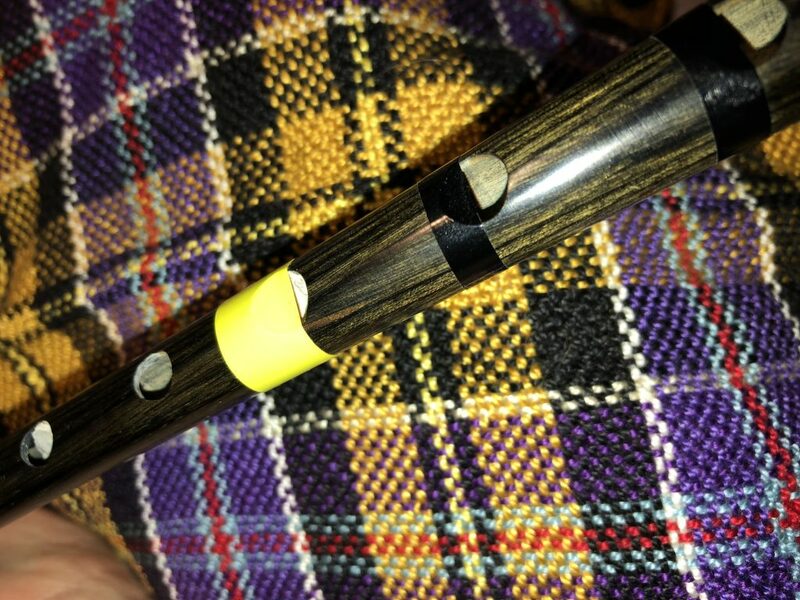 Colin Kyo with full Ezeedrone reeds and an old beat up Gilmour chanter reed in an older CK chanter.